This is one of my all-time favorite layouts. I think it's the picture of my son & DH - miraculous really that they are both posing AND smiling. Or maybe it's the story - it's really how I feel. No, wait, I think it's the aqua and green color scheme which I seem to do alot. Whatever it is, I love this one. It's a combination of a whole lot of manufacturers - Scenic Route, Making Memories, October Afternoon, Jenni Bowlin - that somehow came together pretty nicely. I love that my son's birthday is represented in the bingo card - 8/4/05 and I highlighted it with an aqua Dauber Duo. I am a lucky girl indeed to have these two in my life! 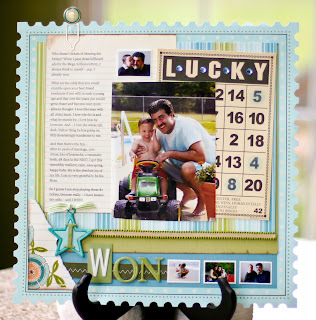 A great big thank you to Scrapbook Trends magazine for publishing this layout in their June 2009 issue! So here I am, writing a post on the blog that I swore I would never start. But then a funny thing happened. I started reading a bunch of blogs and I really liked it. I love to start my mornings with a large iced coffee and my beloved blogs. Every single day I'm inspired by Kelly's, Candice's and Cindy's work (just to name a few). It's a great way to start the day. I love to follow a scrapper's progression through the hobby. It's amazing how much their work evolves over time. So that got me thinking, and I realized that I would really like to keep a diary of my work too. A place where I can see in black and white where I've been and how my pages (and my boy) have changed over the years. So here I am and that's my story. Let the journey begin! 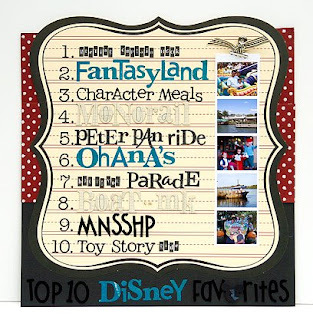 And um yeah, just so you know from the get go - there'll be alot of Disney pages, alot lot - because I'm one of those Disney freaks that stalks disboards.com and visits every year. Every. Single. Freakin. Year.